Facebook Analysis For March - Videos And Photos Rule Engagement Totally! Facebook Analysis For March – Videos And Photos Rule Engagement Totally! As a follow up to our Facebook reach study in February, today we will look at both reach and engagement on the platform in the month of March. This time we have also increased the number of pages in our study from 500 to 5,000. The same data set used for this study is available to you now. Have a look at our free tool, Facebook Page Analyser, see the latest data and check how your own page compares in reach and engagement. For more on what the analyser does, take a look at details in this post. Average organic page likes growth in March was at 0.53%. 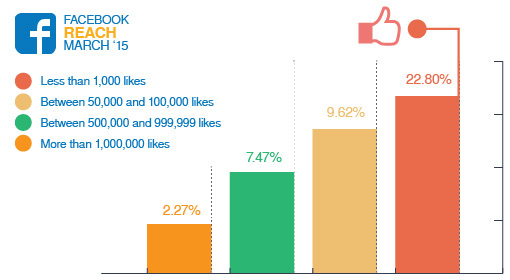 Pages under 1,000 likes had the highest page likes growth with 1.62%. Facebook removing some inactive page likes during the month could have something to do with this low growth. Pages reached 2.60% of their total audience with an average post. 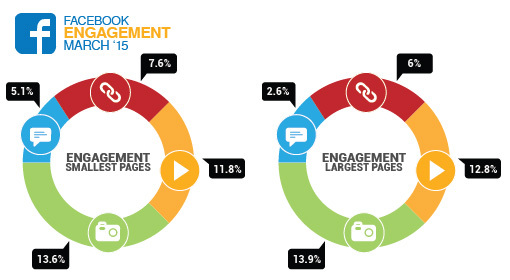 Of the people that were reached pages got 11.83% of them to engage on average. In general, very large pages of over one million page likes got very low organic reach. For them the average post reach was at 2.27% while engagement was at 11.64% of people reached. The reach increases the smaller the page is. Pages between 500,000 and 1 million likes for example achieved 7.47% reach and 11.73% engagement. Pages between 50,000 and 100,000 had 9.62% reach and 12.52% engagement. For pages under 1,000 likes the reach was 22.80% and the engagement was 14.21%. Link posts provided us with our highest reach organically for the second consecutive month. With a link post, pages reached 4.48% of their total page likes on average. Status updates came second with 2.62% of page likes reached. Photo reach was at 2.14% of the all page likes. The lowest reach was for video posts at 1.85% of the audience. The same trend of smaller pages doing better than larger pages was seen here too. Pages with over one million likes only reached 3.78% of their audience with a link post (the best performing post type) while pages with less than 1,000 likes reached up to 30% with video posts (the best performing post type). For engagement, the best post format to use was video with 13.92% of those reached engaging with it. Photos performed almost as good by engaging 13.71% of people reached. Links engaged 7.28% and status updates only engaged 4.63% of people reached. There were notable differences in terms of what post format achieved the most engagement between the page sizes. For the smallest pages photos were in the lead with 13.64% engagement, videos with 11.80%, links 7.59% and status updates 5.11%. For the largest pages the numbers were 13.89% engagement on photos, 12.80% on videos, 6.01% on links and 2.56% on status updates. Only 7.38% of pages we looked at used Facebook ads to help them boost their reach. If we looked at pages over one million likes this number was at 14.60%. Considering the low reach of these very large pages, this is a good move. Facebook ads are an efficient way to boost the growth and engagement of your page and can be a solution for larger pages struggling to reach people organically. One way that you can be introduced to page ads is by taking a look at our Facebook Post Notification feature. If you are running a very large page you will be reaching a very low number of your page likes organically. These numbers seem especially low when considering the high organic numbers on Instagram. Only 7% of pages are using ads, but this number goes up to 15% for larger pages. Facebook Page Ads are the most efficient way to reach all of your page likes and a new audience. You could gain an advantage over your competitors by boosting your posts. Photos and videos get the highest engagement on average. Put more focus on visual content if you wish to optimise your engagement. Have a look at our free tool, Facebook Page Analyser, see the latest data and also check how your own page compares to these metrics. For more on what the analyser does, take a look at details in this post.